Remember to measure your pet for the paw-fect fit. The Pet Life Helios Blizzard Full-Bodied Reflective Dog jacket is the perfect jacket for dogs mountaineering and braving the most extreme conditions. Created for blizzard, typhoon, hurricane and rainstorm weather, the double waterproofed outer shell is wind-proof, breathable and tear-proof with 3M reflective lining for visibility in emergencies. The interior is made with impermeable Blackshark technology and high-quality anti-static fleece for added warmth, breathability and ventilation. The straps by each leg and adjustable inner lining with top zipper create a comfortable fit for each dog with out wind entering the jacket or the dog’s hair from getting caught. Made to withstand the harshest weather conditions, including blizzards typhoons, hurricanes or rainstorms. Outer shell is double waterproofed, windproof, breathable and tear-proof with 3M reflective lining for emergency visibility. Interior features a thick layer of warm and protective anti-static fleece that offers a fantastic ventilation system. Perfect for extreme activities like high-altitude mountaineering. Adjustable leg straps and auto-adjustable inner tubed lining provide a great fit. Fuzzy fastener and zippers allow for easy on/off and prevent any wind from entering without pulling their hair. Machine wash in cold water. Tumble dry low heat. The jacket leaves a couple of inches of the back uncovered. The next larger size was then huge in the body and unworkable. The zipper really ought to zip from neck to tail to make it easier to put on the dog. The zipper is also difficult to zip. Wonderful for extreme weather and cold temps! This jacket is perfect for winter excursions in freezing temps and snow. It has good coverage and is fleece insulated, so warm. We even layered ours up with another fleece layer underneath. We live at 9K ft. elevation in CO and get temps of -20F + quite often so this is key for our pup to join us for late night skinning, skiing, etc. Should have listened to the other reviews about the size being off. 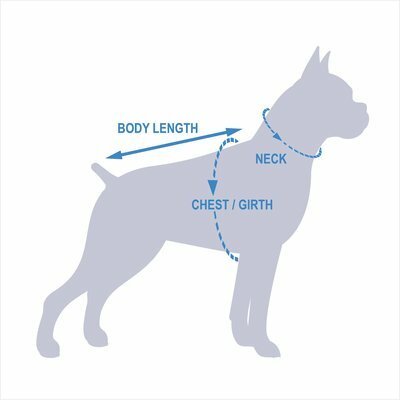 I have a 58lb or so pup and she (borderline) met the measurements for the XL. It's just too tight. I didn't put it to the test, but I was afraid it would cause chaffing and inhibit range of motion by being too tight. Bottom line: You'd probably be best off ordering a size up if you're anywhere near the max measurement for the size you're like. Otherwise, it looks like it would be a good product. We live in CO and all enjoy hiking. Our "little man" (about 20lbs, but long legged) is game, even when the snow gets deep. Problem is it balls up on his leg fur, and forms little snowy ice balls. This jacket has done an admirable job of keeping his spindly little legs warm, and snowball free. We've done a few hours of snowy hikes so far, and he is very tolerant of the fit. To get it on him, I just flip him on his back onto my lap. He loves this for belly rubs, but probably not every dog does. Based on photos, I thought this was a "puffy" jacket, but it's just medium weight fleece, with a nylon shell. Still one of the warmest I've found so far. Just got this coat today. Temps well below zero in Michigan. Fits my 60 lb American bulldog /boxer mix perfect. Along with her dog boots I had a happy, warm dog. Looks like it’s very well made. I got this coat last year in red for my put mix who has super short fur and feels every ounce of the cold weather. He LOVES it!!! He has full mobility & can run & play at the dog park without any hesitations or restrictions. In the colder days when it gets into the teens I'll just layer it with a fleece onesie i also got here on Chewy & he's off to the races again. Also last year I measured him wrong & Chewy was Great about assisting with getting the right size & getting it to me in a timely manner. Love Chewy!! !